Orange Anti-Slip 3320 protects your staff and customers from slip and trip hazards,warning them of potential risks and danger in advance. Jessup coloured Safety Track® combines unrivalled slip protection with powerful visual warnings. Why Jessup® Coloured Safety Track®? Like all Jessup® Commercial Grade Safety Track®, the grit that forms the anti- slip surface is durable and suitable for interior and exterior use. 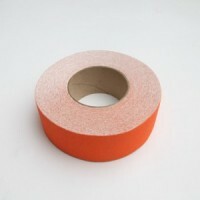 A wide range of colours means you’ll always find a coordinating or contrasting tape for your application. Choose safety tapes in traditional black/yellow stripe (including “Caution” or “Watch Your Step” messaging) to deliver the strongest visual cues. All the visual power and anti-slip performance of regular commercial grade tape, in a mop-friendly formula that makes cleaning easy.